« Why should we consider implementing DHCP Snooping? 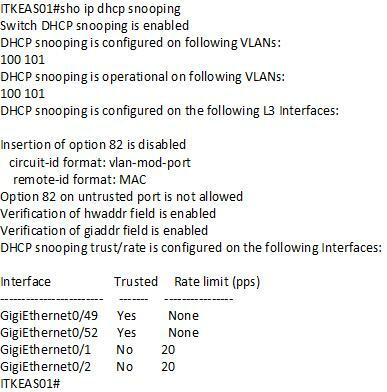 How to configure DHCP Snooping in a Cisco Catalyst Switches. So here we go, with the configuration of DHCP snooping on a Cisco Switch. This feature protects the network by allowing the Cisco Switches to accept DHCP response message only from the authorized servers connected to the trusted interfaces in a Cisco Switch. All Switch to Switch connections are configured as 802.1 1Q Trunk ports. 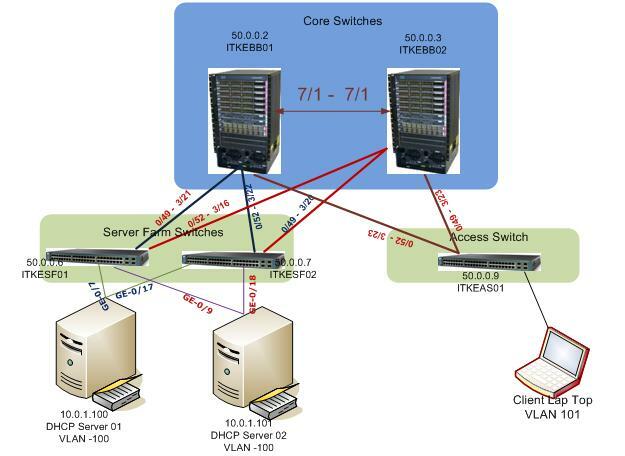 IP Address and HSRP Details for the Core Switches From the above scenario we have two Cisco 6513 Series Switches as a Core/ Distribution with three VLANS one for management of Switches VLAN 50,VLAN 100 for all the servers and VLAN 101 for clients. Two Cisco 3560 Series Switches as Server Farm Switches and a Cisco 3560 Series Switch as an Access Switch.There are two DHCP servers with an IP address 10.0.1.100 and 10.0.1.101 connected with Server Farm Switches with HP NIC teaming. We configure DHCP Snooping based on above scenario. The first step to configure DHCP Snooping is to turn on DHCP snooping in all Cisco Switches using the “ip dhcp snooping” command. For further reference please do check this article from Cisco about DHCP snooping.